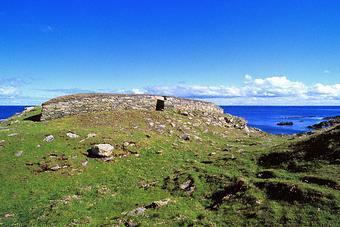 A defensive Iron Age blockhouse sited in a spectacular position on a promontory of the southern tip of Shetland. This massive blockhouse lies behind two ditches that cut off the promontory from the mainland and, between them, a 6.4m thick stone rampart. The blockhouse was once 22m long, but its south end has been destroyed by cliff erosion. As visible on the left of the photo, the wall strangely doesn't reach the cliff edge to the north side. There is a single entrance leading to a stone-lined passage with door-checks and bar-holes. The blockhouse is 1.5m high and there are three cells within its 6m wide wall. The site was excavated in 1935.